(Bloomberg) -- A day after Asian markets fell, investors found a reason to buy shares: China’s promised more measures to help support its slowing economy. That sent markets across the region higher, led by Hong Kong and Shenzhen bouncing back to recover from Monday’s losses. South Korea, Singapore, Taiwan and India also posted solid gains, and Japan reopened in positive territory after a holiday. The benchmark MSCI Asia Pacific Index advanced as much as 1.1 percent to hit an almost six-week high, while S&P 500 Index futures climbed as much as 0.8 percent at one point. Rather than wait for direction from the market, investors appear to be charting their own course, latching on to the prospects of Chinese tax cuts “on a larger scale.” The government will keep lowering taxes, especially for small businesses and the manufacturing sector, according to a statement distributed to reporters before a press conference with officials from the People’s Bank of China, Ministry of Finance and others. After the Chinese market close, data showed the nation’s credit growth exceeded expectations in December, with the second acceleration in a row indicating efforts to spur lending are having an effect. Investors are looking past global growth concerns after Monday’s hiccup and ahead of an upcoming Brexit vote in the U.K. Parliament. In the U.S., Citigroup Inc.’s earnings release wasn’t so bad. 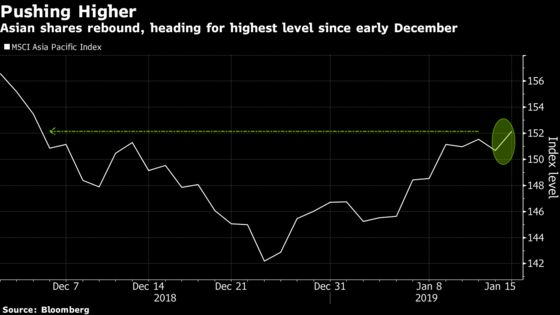 While reporting a plunge in fixed-income trading, its chief financial officer said the trading environment is beginning to improve, spurring a 4 percent gain in its shares. JPMorgan Chase & Co. and Wells Fargo & Co. post results later Tuesday. Still, for China to get more aggressive on stimulating its economy beyond reactive responses, it will need to come to some sort of resolution on the trade-war front first, said Norman Villamin, chief investment officer for private banking with Union Bancaire Privee. With a March deadline looming on talks with the U.S. and the first six months a “feeling-out period” for China’s policy makers to digest the economic impact, this could set Chinese markets up nicely for a pickup beginning as soon as the second half of the year, Villamin said. After adding to Chinese stocks in the fourth quarter of last year, UBP may look again for opportunities in anticipation of a back-half rebound in China, he said. “Markets like to anticipate, that means if there’s a re-acceleration and stimulus in policy in the back half of the year, that means the first half of this year is when we want to start finding our opportunities,” he said. In such a scenario, investors who have been more defensively positioned in Asia will shift toward more cyclical exposure, and you may see industrial commodities pick up as well, Villamin said. As for Brexit, so far the issue has been largely seen as a domestic one and less of a direct concern for Asian investors, Villamin said. However, a less-than-orderly Brexit situation may create demand shocks in key U.K. trading partners such as Germany and the Netherlands, potentially tipping Europe into recession, he added. Brexit prospects are more up in the air than ever, with Prime Minister Theresa May set to see her deal rejected in the biggest Parliamentary defeat for a British government in 95 years. It’s anybody’s guess where the U.K. goes from here.